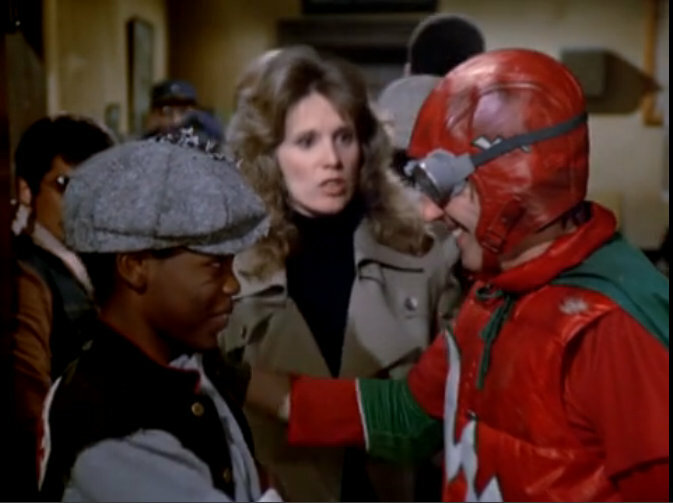 Previously on Hill Street Blues: Belker’s investigations kept getting interrupted by a costumed man calling himself Captain Freedom attempting to clean up the streets on his own. Frank got caught in the middle of a political chess match and faced all sorts of scrutiny at a grand jury investigation. Renko and Bobby were stuck in comedic C-story hell. We’ve reached the halfway point of Hill Street Blues season two. Thanks to those of you have been reading and sharing the pieces. I enjoy doing them. In my reviews of both the first and second season of Hill Street Blues, I have praised the show’s use of serialized storytelling, an approach that was fairly novel at the time (and really still kind of is in the cop show arena). Hill Street‘s serialization had great impacts on the entire landscape of television and most look at the show was one of, if not the, forefather of the brand of storytelling that we’ve all grown accustomed to loving in contemporary television. Of course, like all serialized stories, once HSB gives itself over to a certain ongoing thread, there’s very little to do to get out of it. Many of you probably recall all the discussions critics and fans had about the mid-story changes Damon Lindelof and Carlton Cuse made to Lost—particularly in season three—so you know that it isn’t particularly easy to run away from a story that isn’t working. I don’t mean to minimize the past but I have to imagine that these difficulties were even more stringent in the past, when audience feedback didn’t come as quickly, easily or loudly and producers weren’t able to be locked into viewer or critical thought with ease. Many episodes were—and still are—written in a vacuum, which keeps today’s staffs from listening to audience reaction too much. But as a viewer, serialized storytelling is a fickle B. When it’s good, it is so good, I-need-to-have-more-right-now-like-I’m-Skinny-Pete-on-Blue-Meth good. And when it’s bad? There are few things more frustrating than watching an ongoing story in a serialized show that doesn’t really work. Sometimes it feels like the dreadful story will never end, or that certain characters will never go away. We can combat this frustration by watching shows much more quickly on DVD or through various streaming means but it’s nearly impossible to erase it all together. Smack-dab in the middle of its second season, Hill Street Blues embodies both the exhilaration and frustration with serialized storytelling. Although the season has been full of short, one- to two-episode arcs, this middle portion’s primary action has been driven by two big stories: Captain Freedom’s crusade to clean up the streets and Frank’s attempts to simultaneously survive and stop the political maneuvering of the Sullivan Commission grand jury. If you read my review last week, you can likely guess how I feel about both stories. One is complex, calculated and full of the kind of things that HSB does best—somewhat-challenging adult stories with a tinge of political and/or socioeconomic shading—while the other is about a goofball running around pretending to be a superhero and failing miserably. Captain Freedom makes two more appearances in these episodes and any remnant of charm the character had (read: next to none). As I said in last week’s review, I think the idea of a guy trying to take matters into his own hands and being inspired by superheroes is a compelling one, but the execution of each of Captain Freedom’s appearances is flimsy and one-note. I don’t want to harp on the tonal mish-mashing for too long, yet I can’t help but note that the character could have worked had he been given either more to do or been grounded in a just a bit more reality. Instead, Freedom again shows up in “Delgado” and naively and ignorantly assumes Belker needs help, only to have Belker dress him down. This sequence is a near-recreation of what came in the previous episode and really, even more of a failure because Belker’s advice seems to be falling on deaf ears. I get it, that’s basically the point of Freedom. He’s naive, and he thinks he can save people by jumping around in a stupid costume. Ultimately, this is his downfall, as “Freedom’s Last Stand” features the character running into the middle of a dramatic, dangerous shoot-out, only to be gunned down because he is completely unprepared for real criminals shooting at him. The whole arc, I guess, is intended to show us how Freedom’s uneducated desire to do good gets him killed and perhaps that further reflects the show’s overarching intention to discuss what kind of person one has to be to be a cop on these streets. Finally, maybe in future episodes, Freedom’s death has a great impact on Belker (I hope that it will) and perhaps that impact is related to these aforementioned themes. Nonetheless, if the character is going to make four substantial appearances and a slow-motion death scene coded with “this means something” dramatics, the writers need to work harder to make those appearances diverse, or at least make his death matter in some way. Serialization works when stories are developed over time, leading to a satisfying conclusion. Freedom’s “arc” had little development and the conclusion was far from satisfying. Live-action superhero stories were still a bit of a struggle in the early 1980s and it’s possible that Bochco and his team simply didn’t know exactly how to integrate a character like that into the show’s world. I have no problems with goofy superheroes, nor do I want them all to be gritty in a Nolan-esque way. Even just a few additional details about why Freedom was taking this action could have greatly improved this story. The repetitive nature of Freedom’s scenes combined with the silly execution of the character resulted in a poor storyline, one that unfortunately took up solid chunks of the last four episodes. I appreciate the show’s willingness to try something that is really quite odd and not part of the typical cop show rhythms, but it simply didn’t work. The aftermath might be stronger, and I reserve the right to change my mind of course. Nevertheless, I can’t imagine I will. Watching those episodes in short order helped curb the pain of all the Freedom scenes, so I cannot imagine how much I would groan had I watched HSB on a weekly basis 20 years ago. Thankfully, this pair of episodes was buoyed by the strong Sullivan Commission story that feels more connected to the kind of things Hill Street does well. Instead of hitting the same beats like the Freedom story, this one progresses in logical fashion. Frustrated by the ambush he faced in the grand jury, Frank goes on the offensive in hopes of keeping the Hill out of any corruption charges and putting an end to the political machinations he’s been thrown into. “In Freedom’s Last Stand,” Frank’s internal debate manifests in more external ways. He assures Delgado that he won’t lose his spot—or his money—and he gets on Phil for promoting the inter-agency poker match amid the big corruption investigation. By the time Frank actually makes it back in front of that grand jury, he’s ready to defend what he believes in, no matter the cost. He stands up for his decision to keep Delgado on the payroll, refuses to throw anyone from other districts under the bus and eventually, hands in his gun and badge to Daniels. Not bothered by the outbursts, Daniels refuses to accept Frank’s resignation (it certainly doesn’t help that Frank has some inside scoop about Daniels’ manipulative ways). Ultimately, Frank realizes that he never actually wanted to quit but certainly thought about it, and always wanted to protect Delgado’s pension (which he does). This story is how to approach serialization—albeit in a short burst—with both plot and character. The Sullivan Commission storyline had clear stakes (Frank could gain a promotion and then perhaps lose his job, depending on the circumstances and what he decides to do) and more importantly, it caused a character to take action, allowing us to learn more about him. We knew that Frank would go to bat for his officers, we’ve seen that before and as a character trait, it isn’t particularly original. However, this arc showed us the extent at which Frank would do this, while making him question his own ideals along the way. Overall, it further solidified Frank as the rock-solid moral center of this show’s sometimes-crooked universe and yet also told us that he is willing to step outside legal bounds when necessary. And heck, we even learned a little bit about Daniels, Division and the general political structure within the department. Simple, effective storytelling. When serialization is done right, it can look that way. 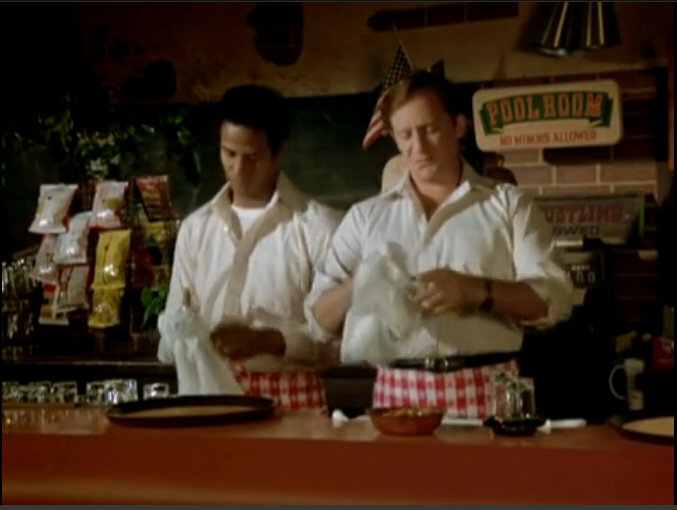 In shorter expression of quality serialization, both of these episodes feature an entertaining undercover operation that sees Belker, Bobby and Renko open their own restaurant as part of the corruption angle Daniels wanted Frank to pursue (well, before he screwed him). I’d love to understand Frank’s logic for deciding who goes undercover, considering LaRue and Washington were left out and Bobby and Renko are uniforms. In any event, the op is blown up when multiple men try to stick up the place and a shoot-out ensues (this is where Freedom dies). Anytime dramatic shoot-outs occur, the show kicks it into slow motion. A sign of the times, I assume. Speaking of undercover assignments, Goldblume takes one of his own, leading him to hit the streets in drag. A crook tries to take his purse, all hell breaks loose and although he gets his face beaten in, Goldblume seems re-energized by the fight. I’ll keep an eye on that. The Hill’s representative in that semi-secret poker game? Lucy Bates. She loses—only barely—and Joe decides to take the opportunity to rub her back and try to kiss her. It, as you might expect, does not go well. I love how their relationship is unspooling: Methodological, realistic and charming, with just a little bit of new layers added every week or two. Again, solid long-term characterization. This Week in Phil’s Sexual Exploits: A short return! The undercover cop/file clerk spends a lot of time eye-balling Phil, who chides her about falling for him, considering it seems to happen way too often. Entertaining stuff from Michael Conrad. This Week in Roll Call Gags: Meh. Nothing to discuss, really. More weirdly sexist jokes from Phil about various female officers. This is a troublesome pattern that surely will result in a major story, right? RIGHT? It has to be another bit of long-term serialized storytelling. Please.